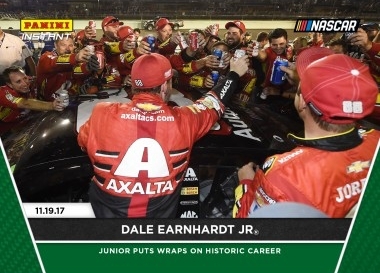 Like the many other print-to-order sets, 2017 Panini Instant NASCAR Racing brings timely card releases to collectors within a specific sales window. 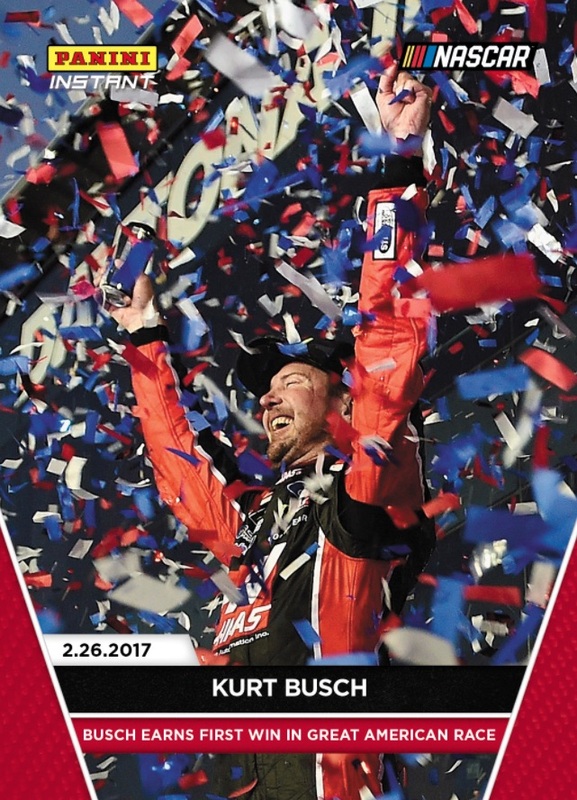 Focusing on the race winners, the 2017 Panini Instant NASCAR Racing base set starts with Kurt Busch's success at the 2017 Daytona 500. The cards are issued in several tiers of rarity with a 24-hour availability for the main card. In addition to the true base that totals the amount ordered during the selling period, Green (#/10) and Black (1/1) parallels present considerable rarity. Modifying the look slightly, the main 2017 Panini Instant NASCAR Racing design sees an update from the 2016 set. This includes an angled border at the bottom and a more subtle font for the racer name and caption. There is also a decrease in the parallels as 2016 offered five options. Assuming that prices hold true for the entire year, individual base cards sell for $9.99 while the Green ($49.99) and Black ($99.99) parallels come at a higher cost. Collectors can also get discounted prices on the base cards by ordering larger bundles of a specific release. As more races are completed, additional details and cards will be added to the 2017 Panini Instant NASCAR Racing guide. Check back for more information. 2017 MARTIN TRUEX JR PANINI INSTANT NASCAR #3 LAS VEGAS WIN - ONLY 60 MADE SSP! 2017 JIMMIE JOHNSON PANINI INSTANT NASCAR CARD #8 BRISTOL WIN ONLY 69 MADE SSP! 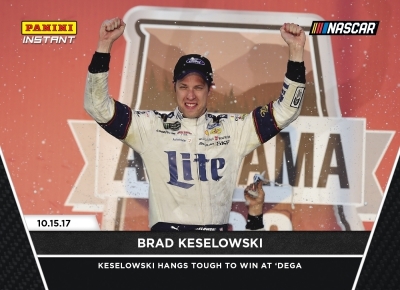 2017 BRAD KESELOWSKI PANINI INSTANT NASCAR #29 TALLADEGA WIN - ONLY 57 MADE SSP! 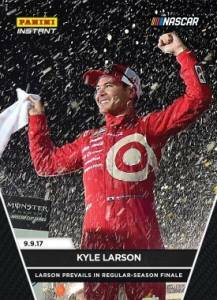 2017 KYLE LARSON PANINI INSTANT NASCAR #5 FONTANA WIN - ONLY 80 MADE SSP! 2017 MARTIN TRUEX JR PANINI INSTANT NASCAR 1ST CHAMPIONSHIP - ONLY 61 MADE SSP! 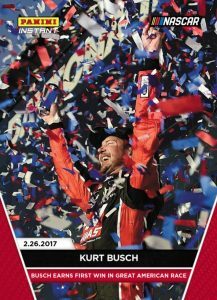 2017 KURT BUSCH PANINI INSTANT NASCAR #1 DAYTONA 500 WIN - ONLY 90 MADE SSP! 2017 BRAD KESELOWSKI PANINI INSTANT NASCAR #2 ATLANTA WIN - ONLY 64 MADE SSP! 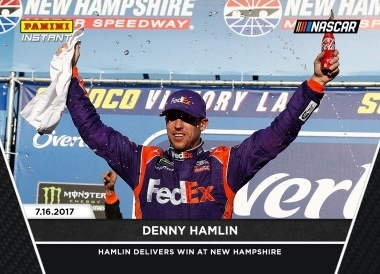 2017 DENNY HAMLIN PANINI INSTANT NASCAR CARD #18 LOUDON WIN - ONLY 55 MADE SSP! 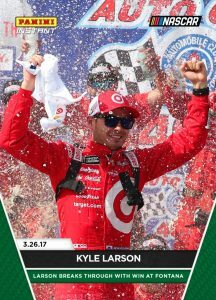 Kyle Larson 2017 PANINI INSTANT FONTANA 3 26 SECOND NASCAR CUP WIN #5 x 80 RARE! Each release has a base card version and parallels. The event date and sale date are noted. 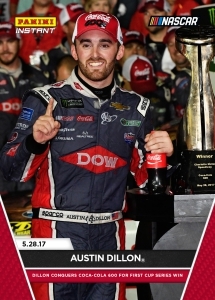 Shop available Instant NASCAR cards at the Panini store. Buy earlier Instant NASCAR cards on eBay using the links below.